Aprecie uma experiência mais rica de TV, rádio ou música sem perturbar a família e sem fios. Esse sistema de audição assistida via infravermelho oferece 3 modos de transmissão e controles de balanço e volume no receptor. O Set 830-TV é um sistema auxiliar de audição por infravermelho para TV com som estéreo. O conjunto proporciona auxílio à audição em qualquer lugar do ambiente, sem a necessidade de cabos e sem perturbar os outros. Conectado diretamente a uma TV, sistema Hi-Fi ou rádio, o Set 830 garante qualidade de som excepcional, que pode, por exemplo, graças à ênfase nos agudos, ser personalizado para a audição do ouvinte. Além disso, o receptor é extremamente leve e, com suas almofadas de encaixe perfeito no ouvido, oferece o máximo de conforto durante o uso. Controles ergonômicos e sinais visuais para os processos de controle individuais mostram que o funcionamento do Set 830-TV não poderia ser mais fácil. How do I add an additional headset to the Set 830 Assistive Listening System? The Set 830 Assistive Listening system is made up of two main components - the transmitter (TR 830) and the receiver (RR 830). Receivers can be purchased individually but transmitters are not available individually. To expand a system to have multiple headsets there are couple of options when adding extra headsets to the system. 1) Purchase an additional receiver (RR 830) to use with the existing transmitter. NOTE: The transmitter can charge one headset at a time and has a slot for an extra battery so the battery would need to be removed from the second receiver and placed in the spare battery charging slot. 2) Purchase a second complete system (Set 830) and use the second receiver with the existing transmitter and then use the second transmitter only as a charging station. NOTE: With infrared systems the receiver needs to be line of sight to the transmitter so the number of receivers that can be used is limited to how many can be within the coverage area provided by the transmitter. 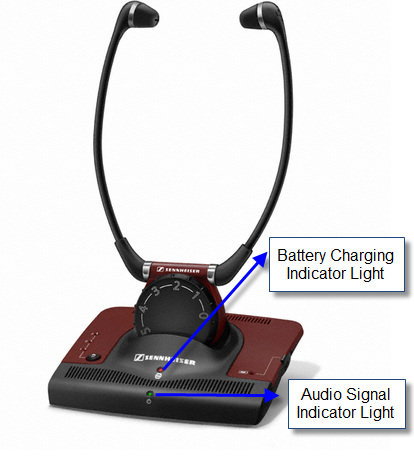 How do I charge the headset of the Set 830 Assistive Listening System? The GREEN light on the front of the base near the bottom indicates that an audio signal is present. This light will go on and off depending on whether an audio signal is present. NOTE: The base can still charge the battery in the headset even if an audio signal is not present and hence this light is off. The crucial light to indicate that the battery is charging is the light directly below the Sennheiser name as this light indicates that charging is taking place. If the headset is not in the charging cradle this light will remain unlit. If the headset is in the charging cradle and the battery is charging then the light will be RED. Once the battery is charged the light will turn GREEN. NOTE: The headset of the Set 840 S and Set 840 TV look different but the concept is the same. NOTE: If the charging light is not coming on when the headset is in the charging position then re-position the headset to ensure that there is no debris (ie: dust, lint, etc) on the contact points of the battery and charging cradle, ensure that there is good contact between the battery and charging cradle and check the power source to ensure it is active. How do I fine tune my Set 830 Assistive Listening System for the best audio? There are a series of adjustments on the Set 830 that can be done to adjust the audio to enhance the listening experience. - Switch for Mono/Stereo = STEREO mode is different audio signals (ie: Left and Right) to each ear and MONO mode has a mixed signal (ie: Left and Right combined) that is the same sound going to both ears. - Speech Intelligibility Buttons = Boosts for low/medium/high frequencies (or can be turned off) for increased audio intelligibility. - Treble adjustment control = Adjusts treble however it is recommended to only be done by a hearing expert. NOTE: All of these adjustments are done assuming that the audio signal getting to the transmitter is a good clean signal. The transmitter/receiver is set to the specific frequencies so no fine tuning for frequencies is needed. If it is an issue like static in the audio then either change the transmitter channel (frequency) or check the audio source for signal issues or check for external influences that could cause the issue. How do I set up my Set 830 Assistive Listening System? The Set 830 wireless headset system can be connected via a 3.5 mm plug into a dedicated headphone jack (which will often cut sound to the external speakers) OR to the RED & WHITE RCA audio output jacks (often found on the back of the TV, cable box, receiver, DVR, etc) and when connected in this manner they will allow for operation of both the headphones and the external speakers. The first step is top connect the transmitter (base station) to power and the second step is to connect the audio cable to the audio source. When the audio cable is connected to an audio source that is turned on the first thing to check is that the GREEN light on the front of the transmitter (base station) comes on. This indicates that the unit has both power and is transmitting audio. Once this GREEN light comes on it is simply a positioning the receiver (headset) within the transmission range of the transmitter. NOTE: The Set 830 is infrared so the transmitter and receiver must be facing each other to work correctly. If the GREEN light doesn't come on or comes on and then goes away when the transmitter is plugged into both a power source and an audio source then it means that the audio signal is is too low (or not getting to the transmitter at all). The transmitter needs a nice, loud signal to work with or the internal electronics will shut off within 5 minutes if no/very little volume is detected to conserve battery life. The signal level needs to be increased before reaching the transmitter. This can be accomplished by turning up your source on variable-level outputs (TV Volume) or by increasing the signal from a fixed-level output (increasing the output level to the audio output jacks which is done through the TV set up options). Try increasing it in small increments to prevent overload which results in distortion. Also check to see that you are connected to outputs and not inputs. You may also try to connect to a cable box (or DVR, HD receiver, etc) and its audio outputs or through a headphone plug. The other lights that appear on the transmitter (base station) are the battery charging indicator lights. There is one light to indicate charging when the headset is in the charging cradle and one light to indicate charging if a battery is in the side charging slot. These lights will light up RED when the battery is charging and turn GREEN when the battery is fully charged. There are three lights are on the left hand side of the transmitter (base station) and these indicate the frequency boost functions. If the frequency boost function is not activated then no light will appear. If the frequency boost function is activated then the light will appear to indicate which level (low frequencies, mid range frequencies or high frequencies) is being boosted. To change from one level to another simply push the frequency boost button. What do I do if the volume control of the Set 830 has stopped working? On the front of the receiver (the part that you wear) is a large black volume dial. This large dial acts like a "cog" and turns a smaller internal volume dial. In a scenario where the volume control of the Set 830 or Set 840 does not appear to be functioning correctly it may be a situation where the dials are out of alignment. Step 1: Remove the large black dial. (It pops straight off). Step 2: Turn the volume all the way down by adjusting the small internal dial. (The small dial is grey colored and about the size of a dime). Step 3: Re-align the large black dial with the "0" just to the RIGHT of the "12 o'clock" position and click it back into place. Step 4: Test the volume. Step 5: You're all set. What is the transmission range of my Set 830 Assistive Listening System? With infrared systems the audio is transmitted via a beam of infrared light. In order to operate the receiver (headset) must be able to "see" the infrared light being created by the transmitter (base station) hence the receiver must be "line of sight" to the transmitter. If the receiver is not "line of sight" to the transmitter or is too far to one side/up/down and is outside of the infrared coverage area or something blocks the light between the transmitter and receiver the audio signal would be interrupted. If the receiver goes beyond the range of the infrared light (ie: too far away from the transmitter) the infrared light will have dissipated and the receiver will no longer be able to detect the infrared light. For optimal range ensure that the transmitter is placed to provide a clear line of sight to the receiver. Often placing the transmitter is an elevated position with a slight downward angle to the receiver is optimal. To increase range Sennheiser recommends trying to increase the audio output signal of the audio device that you have the transmitter connected to. Another factor that can affect range for an infrared system is lighting within the room. Some light (especially concentrated light like a lamp) will cause the infrared light to dissipate more quickly so ensure that the transmitter and receiver is not directly next to a concentrated source of light. Sennheiser offers a range of wireless headset options that utilize a variety of audio transmission signals (Infrared and Radio Frequency) and a variety of wearing styles to suit different wearing preferences. These headsets can be connected via a 3.5 mm plug into a dedicated headphone jack (which will often cut sound to the external speakers) OR to the RED & WHITE RCA audio output jacks (often found on the back of the TV, cable box, receiver, DVR, etc) and when connected in this manner they will allow for operation of both the headphones and the external speakers. All models offer unique functions yet will be able to provide an excellent listening experience and personal preference will play a large part in selection. Our range of wireless headphones can be seen on our website (http://en-us.sennheiser.com/wireless-headphones). NOTE: We do NOT recommend Bluetooth headsets for applications like TV watching as the latency (time it takes for a Bluetooth signal to be transmitted) that is inherent to all Bluetooth devices causes the audio to be out of sync with the video. NOTE: On the Set 830 S and the Set 840 S the induction loop can be replaced with a set of wired headphones to allow for more wearing options. This means that there is a wire from the headphones to the wireless receiver but you are wireless from your audio source. - A 200 - (No wireless signal transmission) - Personal amplifier that amplifies ambient sound and makes it louder but does not receive a signal directly from an audio source via wireless transmission.